Ford Courier, Seat Inca, etc. *OVERDRIVE CAR is subject to availability and client status. Your account manager will advise on packaging criteria for fragile items, if required. 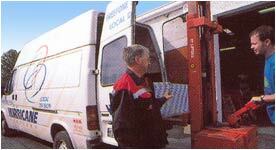 The above services are completed on a logistical basis. Traffic congestion is the single most important factor to consider whilst estimating the completion times for any of the listed services. Please contact our Operations Department (Telephone: 01 411 4111) for up to date information on delivery speeds, particularly at peak times.